2） H. Shin, Symp. VLSI Tech. Dig. Papers, (1991). 3） H. Shin, et.al., IEEE Electron Device letters, 12, Issue 8 (1991). 4） S. Fang, et.al., IEDM Technical Digest, (1992). 5） S. Fang, IEEE Electron Devices Letters, 13, Issue 6, (1992). 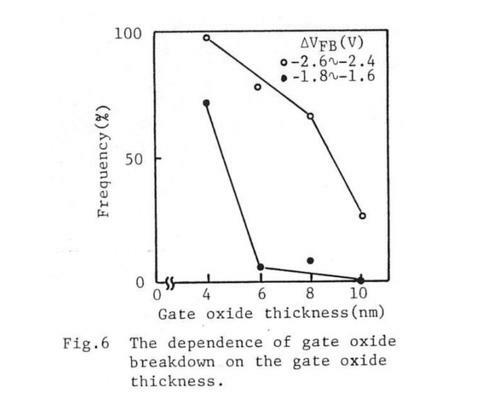 6） Y.Yoshida and T.Watanabe (IC Division, Toshiba), “Gate Breakdown Phenomena during Reactive Ion Etching”, Proceedings of 5th Symposium on Dry Process, p.4 (1983). 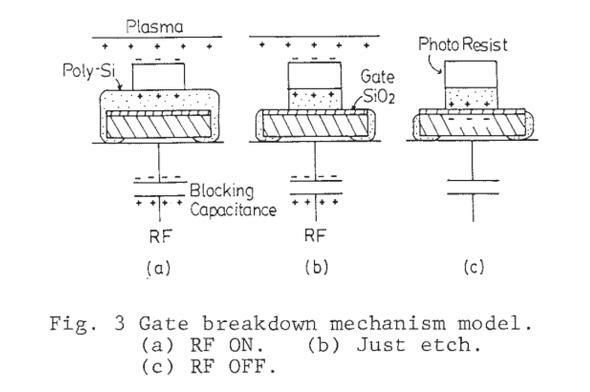 7） Y.Kawamoto (Central Research Lab., Hitachi), “MOS Gate Insulator Breakdown Caused by Exposure to Plasma”, Proceedings of 7th Symposium on Dry Process, p.132 (1985). 8） K. Tsunokuni, K. Nojiri, S. Kuboshima, and K. Hirobe (Hitachi), “The Effect of Charge Build-up on Gate Oxide Breakdown during Dry Etching”, Extended Abstracts of the 19th Conference on Solid State Devices and Materials, Tokyo, p.195 (1987). 図2：東芝の吉田＆渡辺論文（1983年DPS） （クリックで拡大） 出典：Y.Yoshida and T.Watanabe , Proceedings of 5th Symposium on Dry Process, p.4 (1983). 図3：日立の川本論文（1985年DPS） （クリックで拡大） 出典：Y.Kawamoto , Proceedings of 7th Symposium on Dry Process, p.132 (1985). 図4：日立の津国＆野尻論文（1987年SSDM） （クリックで拡大） 出典：K. 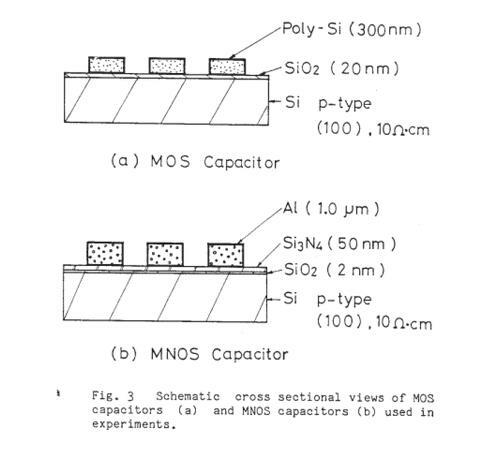 Tsunokuni, K. Nojiri et al., 19th Conference on Solid State Devices and Materials, p.195 (1987). 15） K.Nojiri and K.Tsunokuni, “Study of gate oxide breakdown caused by charge buildup during dry etching”, J. Vac. Sci. Technol., B 11 (5), p.1819 (1993).